As another NHL regular season has passed us by, hockey stat junkies everywhere have another endless sea of numbers to sift through, everything from goals to goals against, shots on goal versus shots stopped, and much more. But while most fans will remember Evgeni Malkin’s 109 points and Steven Stamkos’ 60 goals, there are a bevvy of impressive, interesting, and just plain weird stats from the past season that are also worth a look. Here are ten that I found worth noting, but feel free to mention any others in the comment section below. 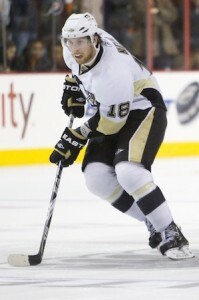 1) James Neal of the Pittsburgh Penguins led the NHL this season with 18 powerplay goals. Meanwhile, the Dallas Stars, the team that traded Neal away last season, finished dead last in the NHL on the man advantage, with only 33 goals scored out of 244 opportunities, for an awful 13.5 percent. That’s gotta hurt. 2) Despite being known as a smooth-skating, offensive defencman, the Montreal Canadiens’ PK Subban had the most penalty minutes out of all NHL defenders, with 119. Stu Bickel and Shane O’Brien were ranked second and third respectively. Considering Subban isn’t exactly counted on for physical play, the amount of time he spent in the penalty box must be a cause for concern for the Habs. 3) At 39 years old, Tomas Holstrom of the Detroit Red Wings is still a force on the powerplay, where he made a name for himself over the course of his career. He scored 10 man-advantage goals for the Wings this season. And it’s a good thing, too, because he only scored ONCE at even strength the entire season. 4) Despite being a defenceman, Erik Karlsson of the Ottawa Senators finished in a tie for 10th in points out of the entire league, with an impressive 78 in 81 games. But how much better was Karlsson than the rest of his blueline peers? Dustin Byfuglien of the Winnipeg Jets, the second highest scoring defender, finished in a tie for 80th overall with 53 points, 25 points below Karlsson. 5) When the New York Rangers signed forward Marian Gaborik as a free agent, many questioned his ability to stay healthy after an injury-plagued start to his career with the Minnesota Wild. Gaborik proved the Rangers wise in signing him, as he played in all 82 regular season games for the Blueshirts this year, leading the team with 76 points. 6) Did any NHL player have a worse overall statistical season than Nino Niederreiter of the New York Islanders? The rookie forward (and 5th overall draft pick in 2010) scored 1 goal and 0 assists, along with a putrid -29 rating, while averaging 10:06 per game over 55 games. Only teammate Milan Jurcina’s league-worst -34 was below El Nino’s -29. 7) Adam Henrique of the New Jersey Devils has an interesting relationship with special teams. He scored 4 shorthanded goals this season in a total of 132 minutes played on the penalty kill. Not bad, right? But, get this, he scored ZERO powerplay goals this season while playing a total of 121 minutes on the man advantage. Wait, what? 8 ) Roman Polak of the St. Louis Blues wins this season’s unofficial Brad Marsh Award as the NHL’s worst shooter. He fired 88 shots on goal but didn’t score even once, the most shots out of any NHLer with zero tallies. 9) While he isn’t one of the 3 finalists for the Lady Byng, Antti Miettinen of the Winnipeg Jets deserves some recognition. He played 45 games but finished with 0 PIMs, the most games played out of all NHL players that didn’t get penalized. 10) The Boston Bruins dominated the NHL at even strength this season. The five players with the best plus-minus (Patrice Bergeron, Tyler Seguin, Zdeno Chara, Chris Kelly and Brad Marchand, in that order) were all Bruins.